Director Darren Aronofsky is the latest big-name filmmaker to turn his talents toward TV, and we're very excited for his small-screen project: an adaptation of Margaret Atwood's apocalyptic MaddAddam trilogy for HBO. Deadline is reporting that HBO has put MaddAddam into development with Aronofsky executive producing and perhaps directing as well. With this, Aronofsky will turn from the watery apocalypse of Noah to Atwood's global pandemic. 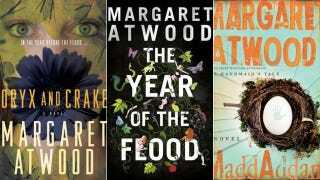 Atwood's books carry us from a 21st century world dominated by corporations with an ever-increasing divide between the privileged and the plebs, to the rise of genetic engineering technology, and past the collapse of civilization as we know it—thanks to a cataclysm whose devastation is evident from the first book's opening pages. It's a project that requires a grand sense of scale—something that Aronofsky clearly has in spades. HBO, Atwood, and Aronofsky certainly sound like a great match on paper; here's hoping it translates onto the screen.